Have you ever wished you could have a quick freshen up when you're out and about? Carrying a big glass perfume or aftershave bottle is inconvenient, cumbersome and can be dangerous if it takes a knock and shatters. I know I have constantly wanted to take my expensive bottle of perfume with me out at night, but the thought of it spilling in my purse stopped me right in my tracks. 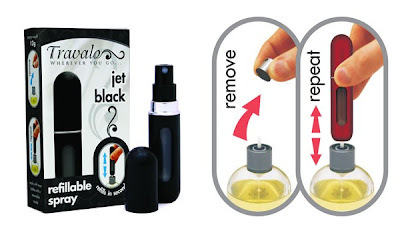 Simply remove the nozzle from your big fragrance bottle, pump Travalo up and down on the tube, and you can be ready to go in just a few seconds. It took me a while to figure out how to use this little thing, but it's fabulous being able to take my perfume with me everything I go! I love my Travalo, and I take it everywhere in my handbag. You can purchase Travalo on their website, nationwide. Find them on Facebook too!